In his metal sculpture, Christopher Huck’s work is informed by masters of the past, including Calder, Nevelson, Zuñiga, Julio González, David Smith, and Eduardo Chillida. Line, shape, motion, and color all play together in work that is visibly appealing and finely crafted. Huck creates beautiful work, reflective of a beautiful, while conflicted world. 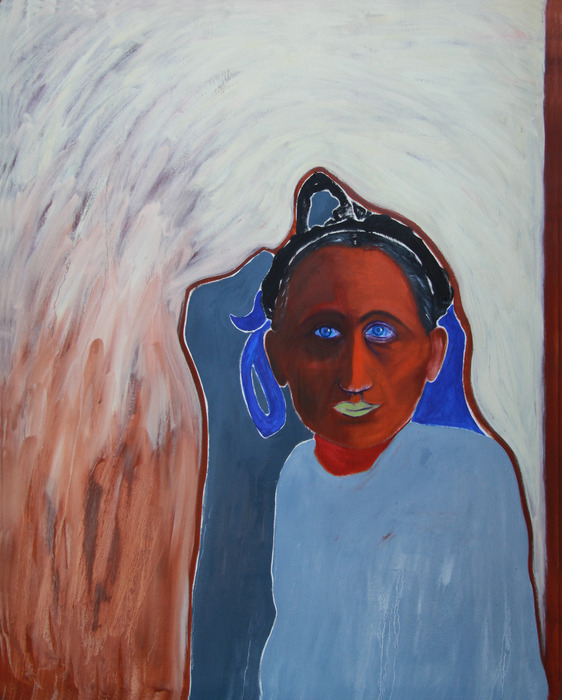 Huck’s painting is obviously inspired by the light and color and ethnicity of the Mexican Southwest, with hints of Modigliani, Gauguin, Rodolfo Morales, Fritz Scholder, TC Canon, and Fernand de Szyszlo visible in his works. The vibrant indigenous culture of México’s Southwest seems to provide endless sources of inspiration and joy for Huck’s colorful canvases and metal sculptures. Huck studied at the San Francisco Art Institute (painting, sculpture, and photography with Imogene Cunningham), the Minneapolis College of Art + Design (painting), and the Nova Scotia College of Art + Design (metalwork with John Little). 100cm x 120 cm, oil on canvas. "Tia Natalia" is a 90-year old elder in our pueblo, and organises the cooking for the grand fiestas here, often orchestrating the multi-day cooking for 500 or so celebrants.